Our signature, sparkling mirror collection is back in a new, larger size. Handmade and featuring a range of golden hues and a rainbow of shiny, oil slick colors, this embossed mosaic glass framed wall mirror makes for a stunning accent piece in any room. 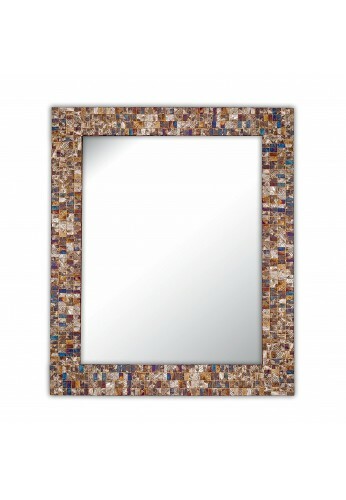 At 30" x 24", our new & unique rectangular mirror complements a number of colors and decor styles. Perfect as a bedroom mirror, bathroom vanity mirror, living room mirror, foyer mirror, reception office mirror, & much more. Make sure you zoom into to see the amazing detail that each mosaic tile contains! Other manufacturers mirrors may look similar, but watch out for mosaic "stickers" that make a mosaic pattern but are not actual mosaic tiles. Our handmade decorative wall mirrors contain genuine glass mosaic pieces, covering an intricate embossed foil underlayment. The result is stunning and cannot be fully appreciated in pictures alone. Perfect for any wall or room that requires an accent mirror that reflects elegance & artisan craftsmanship. 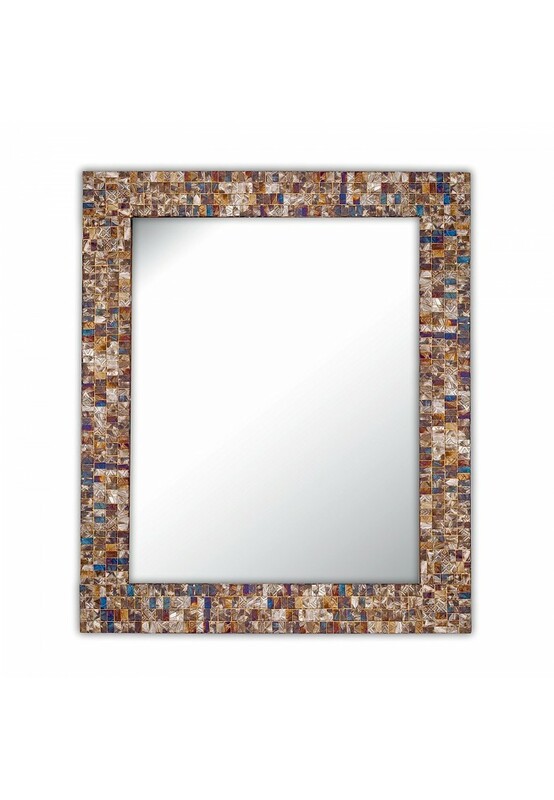 This glamorous hanging wall mirror features intricate, rectangular patterned glass mosaic tiles. Each mosaic tile is hand set for an authentic look that cannot be replicated. 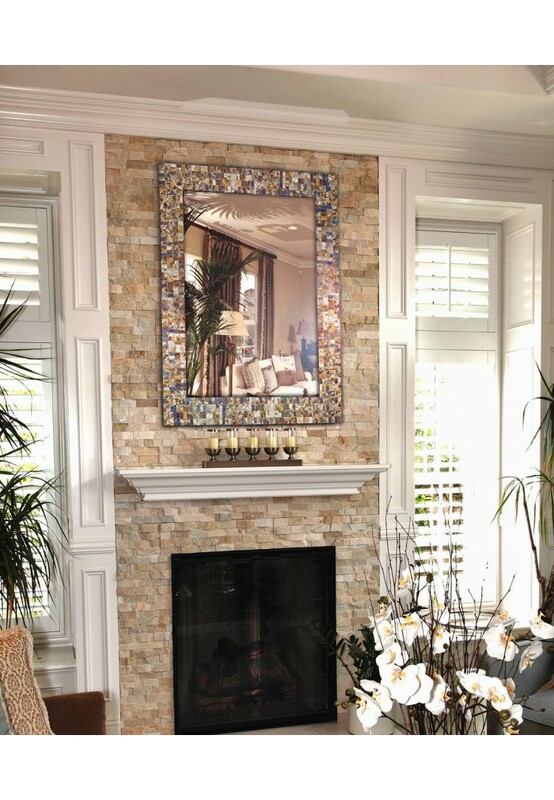 The mosaic mirror frame provides the perfect splash of color to match existing decor. However, make no mistake... this artisan mirror is perfectly capable of making a design statement all its' own. Each DecorShore branded produced is carefully selected, bespoke home decor that you simply will not find anywhere else. As always, limited quantities available for a limited amount of time. Artistic, Unique, Bespoke Home Décor. The mirror is hung.....frame looks good but the mirror is poor quality it makes objects look distorted sort of like a globe effect....things look rounded....not sure it is supposed to look this way or if the mirror is defective. Beautiful mirror! So glad I purchased it, especially now I see it's unavailable. The frame looks like thousands of mini tiles, multi colored of gold, copper, bronze, opal, browns and a beautiful blue, like a royal blue. I never write a review but I'm looking at that mirror on my wall reflecting all kinds of light on those tiles and it's just beautiful, had to write one. Was very pleased with the packaging too. They took great care to be sure it was delivered in one piece. Highly recommend this mirror from this company.